Hi wondering if there is any trick to getting /swagger-ui/index.html to reference the "local" /resources url by default rather than the petstore. ServiceStack.Api.Swagger and ServiceStack.Api.OpenApi open services resources by default. Here is the code in SwaggerFeature which does this. What is your configuration of SwaggerFeature? Did you replace default index.html with custom one? This is on dotnetcore if that matters. For Swagger UI I would recommend to use ServiceStack.Api.OpenApi instead because OpenApi uses more recent version of Swagger UI and Open API specification (formerly named as Swagger), but if you want to use SwaggerFeature, I made a HelloSwagger sample which demonstrates the project with Swagger UI enabled. I don't have Mac right now near me to check the sample on OS X, but looks like current directory where the project is running differs from HelloSwagger/src/HelloSwagger. 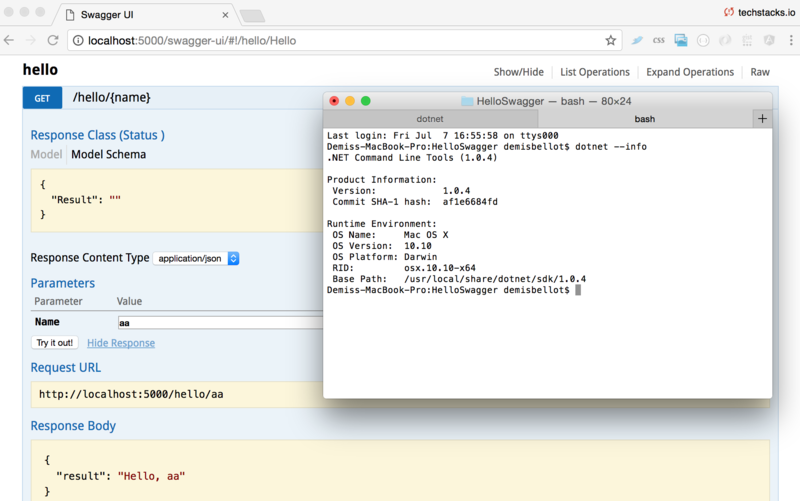 Are you executing dotnet run from HelloSwagger/src/HelloSwagger directory and then open http://localhost:5000/swagger-ui/ link? So not sure what problem you're running into, maybe you can try deleting your NuGet cache? it doesn't re-write the page for your local api. This is also the URL that is on the metadata page.